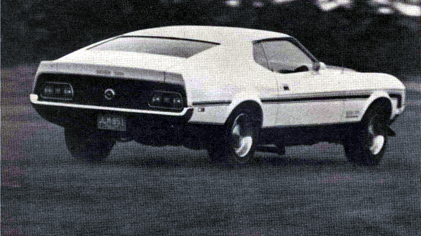 Ford Division’s Boss 351 is some kind of quick machine. Why and how the 351 Cleveland engine responds to being “bossed” is something we’ll discuss a few lines from now. But the production-line car is a matter well worth mentioning right here. The Boss 302 is no more, at least in a production version. Like Chevrolet, Ford has found it costly and no longer necessary to build an engine to the exact size as that specified for the SCCA Trans-Am series. SCCA doesn’t require an engine to start life as a 5-liter nowadays. It can be de-stroked to meet the limit. 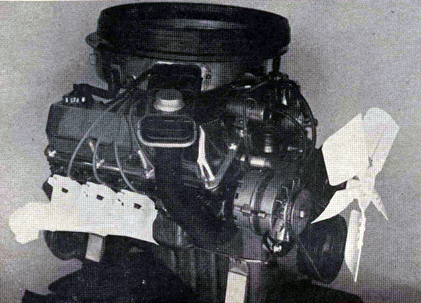 Ford’s 302 T-A engine had a 3.00-inch stroke, and thd 351 carries a 8.5-inch arm. That 302 Boss engine wasn’t exactly cheap to produce, but the 351 Cleveland engine is an assembly-line operation, and the Boss small block parts have been redesigned to fit. Unlike Chevrolet, their enlarged sedan racing engine runs better than its earlier and smaller counterpart. When we ran the ’70 Z/28 Camaro, it wouldn’t even come near the times the ’68-69 302 Zs produced. Of course the car was different, but the ’71 Mustang is a lot different from the ’70 model. Not only is it two inches longer and wider, it is close to 150 pounds heavier. Without changing it from street-legal trim, the ’71 Boss 351 laid down a 14.09-second elapsed time at Orange County Raceway, with a speed of 1O2.78 mph. This is the same track the ’70 302 was driven over, and its best pass was 14.621 seconds with a speed of 97.5O mph. That car had a 3.91:1 limited-slip rear axle gear, just like the ’71 car, and we had to wire around the factory-installed rpm limiter to achieve that 14.621 time. With the rpm limiter removed from the Boss 851, we raised shift points to 6500 rpm for the best e.t. of 13.800 seconds and a speed of 104.82 mph. Previous to this, shifts were made at 6000 rpm. We, meaning all who drove the car that day, were impressed. But just so the story doesn’t get too romantic you should know that the car had been spending some time at Bill Stroppe’s shop in Long Beach before it was sent out on the road. While there it had been fitted with rear traction bars, a new clutch (stock type) and a set of Dough Thorley headers. We can’t vouch positiviely one way or the other as to the engine’s internal integrity, but externally, all was as it should be on a production car. Jetting hadn’t been increased, and this became evident when low-speed full-throttle stars were tried. THe engine stumbled upon transition from primary to secondary throttle opening, and during primary operation on the Autolite air-valve carburetor, the engine wanted always to run a shade on the lean side. We’re certainly not pointing any accusing fingers at this car, but we do like to keep the record straight and everyone informed. While it surely did have a good tune-up job applied, there’s no doubt that addition of headers contributed to the 351’s performance. Better rear spring tie-downs could’ve been used because wheel hop was still evident when leaving the line. After our stock test of the ’70 302 Boss, we added headers and a 4.80 Detroit Locker rear gear. After much tuning and gnashing of knuckles, the 802 put in a best performance of 13.84 seconds with a top end of 108.44 mph – this with shift points at 7200 rpm. When the headers were allowed to exit exhaust gases sans muffler restriction on the 351 Boss, it cranked out consistent 13.6 e.t’s and ran a best of 13.58. The car also registered a half-dozen 107-plus mph speeds. There was no need to go beyond 6500 rpm in each gear. A 4.90 gear would really set the car down into the low l3-second region, but unfortunately, that ratio isn’t factory-available this year. According to Ford literature, a 3.91:1 Traction-Lok is standard, and no other number is available. But there are plenty of gear cutters in the business, so it isn’t any great problem to make a change. Now the Boss 351 is an inspiring super-car, and even though it does have a horsepower-to-weight factor over 10-to-1, insurance companies are well aware of its threat to peaceful underwriting. Insurance notwithstanding, there’s no reason everyone should buy a Boss 351. Any 351 Cleveland engine can be converted into a Boss. Maybe some people don’t like the ’71 car. It doesn’t matter. As good as the news is about how well this small-block Ford runs, the fact that Ford has outlined a way of updating early-model Cleveland engines to current standards is more appealing. Along with parts development, a new catalog entitled “Staging The Cleveland” has been published, with all kinds of inside information and parts numbers. Ford and Autolite dealers should have it by now. Incidentally, Autosport Products, Inc., who market the Shelby line, have also developed a number of aftermarket pieces for the 351-C. ABOVE – Exterior of Boss 351 differs little from 302 except that water pump housing is semi-integral with block. Cleveland engine has flat plate bolt-on pump cover, while 302 is complete item by itself. Ram-Air is standard. New Fords have resistor plugs and return springs in throttle cable. 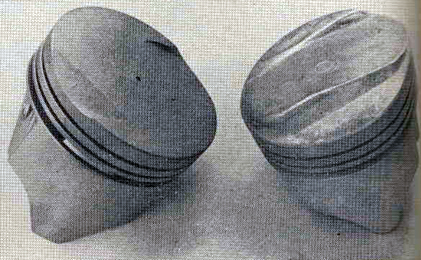 BELOW – Stock high-dome Cleveland piston can be replaced by Boss level slug with higher top and valve reliefs cut full length of dome. The Special Vehicles Program men at Ford began their development way last year, and based their work around a 351-C-engined Mach I. It carried a wide-ratio four-speed, 3.50:1 Traction-Lok axle. Ram-Air hood scoop and F70-14 tires. As received, in stock form, the Mach I ran 15.09 seconds elapsed time with a speed of 94.52 mph. Traction bars were installed because of wheel hop, and an Autolite dual-point conversion kit (DIAZ-12A132-A) added because of high-rpm point bounce. It then ran a 14.75 e .t. and speed of 95.37 mph. First-stage work, as outlined in the Autolite manual, was begun from this point. A four-barrel aluminum intake manifold (DIZZ-9424-G) and 780 dm rated Holley carb (DOOZ-9510-R) was substituted, the resultant performance being 14.55 seconds elapsed time and a speed of 96.30 mph. This Holley four-barrel is the same one that’s used on 429 Super Cobra Jet Fords. After this, a hydraulic camshaft (DIZZ-6250- A) with the same specs as the 428 C-J hydraulic stick was selected. Use of this cam raises torque peak by 600 rpm, and is worth 29 additional horsepower over a two-barrel 351-C cam. Valve lift is A81-inch intake, A90-inch exhaust, with 270-degree intake duration and 290 degrees on the exhaust. Stock rocker arms can be retained, but new valve springs (C90Z-6513-E) with higher tension and inner dampeners are required. Also needed are new retainers. (DOAZ-6514-A), and sintered iron fulcrums (DOOZ-6A528-A). If the work is being done on a four-barrel 351-C, the retainers and fulcrums don’t need replacing. This cam presents no problem when used with an automatic transmission. 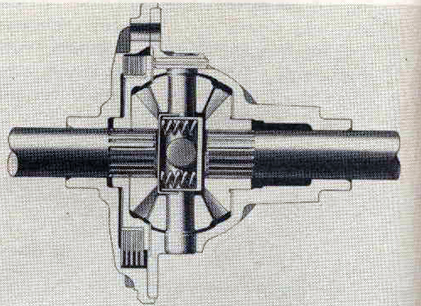 Performance gain on the “mule” Mustang in Dearborn using this camshaft was significant. Elapsed time dropped to 14.26 seconds, and speed jumped to 99.03 mph. The fifth step taken involved tubular exhaust headers. Autolite-Ford doesn’t offer this item, but there’s no shortage of availability elsewhere. A set of Doug Thorley 1 7/8-inch-by-34-inch long tube headers helped the ’70 Cleveland-engined car drop its elapsed time to 14.08 seconds and got speed up to 100.23 mph. With all this accomplished, our heroes back at Ford slipped in a 3.91:1 rear axle assembly (C80Z-4209-A). The Traction-Lok torque-sensitive limited slip was retained with this lower ratio. By adding the gear, elapsed time dropped to 13.08 seconds, and speed went up to 102.63 mph. Final change to this test subject involved slipping in a Boss mechanical cam (DIZZ-6250-B). There’s more to it than just the cam. Actually, this seventh operation is considered the “Dominator Kit.” To complete it, the following items have to be included: DOAZ-6500-C 302 Boss solid lifters; DOZZ-6507 -A intake valves; DOZZ-6505-A exhaust valves, C9ZZ- 6518-A keepers; C9ZZ-6564-A rocker arms (only if converting from a two-barrel engine, or if four-barrel rockers indicate replacement is necessary); C9ZZ-6A527-A 302 threaded rocker arm studs; C9ZZ-6A528-A cylindrical sled rocker arm fulcrums; C8SZ-6A529-A 7/w-inch rocker stud nuts; C9ZZ-6A29-B %(i-inch rocker stud jam nuts; C9ZZ-6A564-A guide plates; and DOOZ-6565-B hardened pushrods which come from the 429 SCJ parts bin. This takes care of most of the parts, but because the 351 Cleveland engine is normally only equipped with a hydraulic cam, the engine has no provision for valve lash adjustment. It is “possible” to get away with using adjustable pushrods, but in some cases the pushrod-to-rocker interference is such that the adjustment end has to be placed down. This means the topside of the motor has to be dismantled to adjust the valves! In addition, rpm limit is around 6000 with adjustable pushrods, and that doesn’t allow full utilization of the mechanical cam. So to do the job right, head modification or replacement is the answer. Using four-barrel heads from a 351-C, 0.300-inch must be milled from each pedestal, and this requires an alert machinist because the surface of each pedestal is not parallel to the head surface, due to the canted valve angle of 351-C engines. ABOVE – When you get to the Boss-level Cleveland engine, your V8 has canted valves, stamped rockers, H-D fulcrums, guide plates, mechanical cam with adjustment capability and super-smooth valve ports. 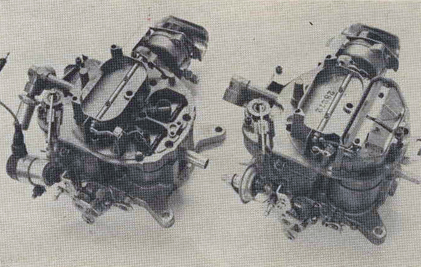 BELOW – Ford now uses Autolite “air-valve” 750-cfm 4-bbl on big engines (right), which is an evolution from the earlier 4300 series 4-bbl (left). When the milling is done, the original stud holes must be drilled .088-inch deeper (use drill size .376-.372-inch in diameter) and tapped 7/16-14 UNC thread. Then the 302 studs will go right in, and when this route is taken, use 428 valve springs (C90Z-6513-E) and 429 retainers (DOOZ-6514-A). The other method of obtaining valve adjustment is to swap over to Boss 302 heads. But this calls for some machine work too. The Cleveland engine routes water to the head via an internal passage that feeds the head. The 302 heads were made so that water is fed in from the manifold. them is fairly easy. Place a 351-C on a Boss 302 head and scribe or dykem-mark the spot where the water must be. It’s in front corner. Then drill at this using an l1A6-inch bit. A drill is suggested; a hand drill would wear out the operator. There’s still a water open on the top of the 302 so a 351-C inlet manifold has to be used; and since it has no water provision, it will seal off the 302 port(s). 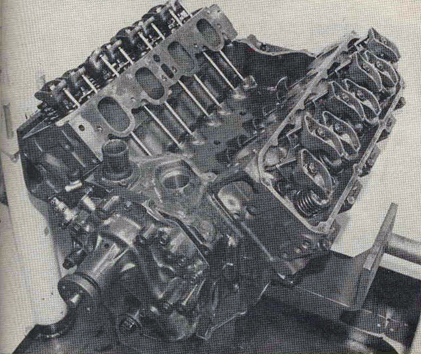 Head gaskets from a 351-C four-barrel (D0AZ-6051-C) are required. When Boss 302 heads are used, 302 valve springs (D0ZZ-6513-A), spring seats (C9ZZ-GA536-A) and retainers (C9ZZ-6514-A) are also to be used. ABOVE – New-style Mustang doesn’t handle as well as its ’70 version. but in Boss form it can hardly be called a slouch. This one came without an abundance of add-ons, which weren’t missed. ABOVE – Muscular Fords feature Traction-Lok differential that is a spring-loaded clutch pack unit. It feels a lot like a ratchet-type limited slip,and doesn’t cost extra on Boss 351s. 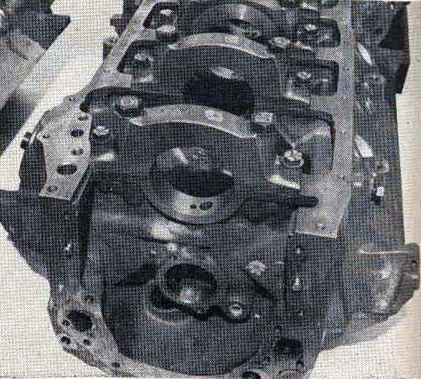 ABOVE – Cleveland built Boss blocks start life with four-bolt main bearing caps. Even though production bearings work fine for most applications, premium main and rod bearings with tin-babbit overplate called 351-C “GT,” are available through Autolite-Ford. Now that the Boss 351 is a item, simply substituting these heads on a conventional Cleveland engine involves no machine work, but they’ll be somewhat rare for a few months, and not as cheap as performing surgery on the cylinder heads outlined above. When going to the “Boss” stage, it’s wise to increase carburetor size. Autolite-Ford recommends an 850-cfm unit such as a Holley R-4781-AAA. This is a dual-pumper unit, and initial jetting should be No. 80 on both primary and secondary sides. 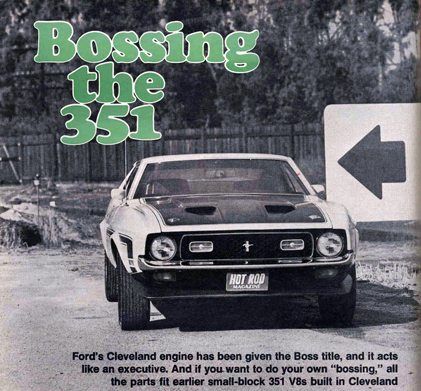 At this point, the basic Cleveland engine is identical to a Boss 351 in all respects save for four-bolt mains. Even these can be had from speed equipment manufacturers. The Ford crew retained the Cleveland heads on their car, and with everything buttoned up, it ran 13.80 seconds e.t. and a speed of 104.02 mph. By the way, all runs at each stage were made with street tires mounted and with exhaust system capped up. In other words, they equaled the times of our ’71 Boss 351. This Cleveland-design engine is a “clean”-burning powerplant. Ford wouldn’t release actual figures on emission counts, but the Boss 351 is able to pass established emission levels without the aid of a thermactor (air pump), despite its having features that traditionally hinder low smog readings. Our test Boss didn’t get overly thirsty on fuel either, reaching a “high” of 14.50 mpg and a low of 11.58 miles per gallon. The ’70 Boss Mustang handled better than this one, perhaps because it didn’t have an Autolite four-barrel that starved out halfway through a hard corner. Ford now installs, at extra cost, the Saginaw variable-ratio steering, and we can’t say it works as well on the Mustang as it does on the Camaro. The Camaro has its steering linkage mounted ahead of the front crossmember, and the variable ratio serves more to bring the steering back to neutral than anything else. But the Mustang has its steering linkage behind the crossmember, and the variable-ratio unit induces a sometimes “shaky” oversteer. It might be okay for matrons in LTDs with bedspring suspension, but the Boss 351 doesn’t need it. The ’71 Mustang is a long way from that refined Falcon-based Mustang we all gaped at in 1964, and for that, present Mustang owners can be happy. This one feels like it’s taking on the size of a Torino (in some ways it but no matter what its shape or size may resemble it sure runs like a racer. The Boss 351 is going to salt away a few Z/28’s before its season is up. ABOVE – Boss heads have minimal shrouding around valves and good exhaust. 302-design head chambers measure 58.5cc on the 351, but hydraulic stick, 302 heads aren’t necessary. BELOW – All these parts are needed for cam conversion. CARBURETION..Autolite4-bbl spread-bore, 750cfm.1.565-in.-dia. primary bores,1.690- in.secondary bore dia.